It's time to say good-bye to a fabulous Sale-a-bration season. It was 3 months, that's a season, right? It all comes to an end tonight, folks....get your freebies while they last. 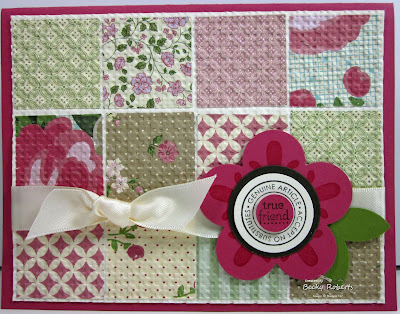 With every $50 purchase, you can choose a free product from the Sale-a-bration catalog. It all ends tonight!! If you've ever thought about being a demonstrator, the starter kits are on sale. I'm still playing with the Nature Walk set I received at the Boise Regionals. 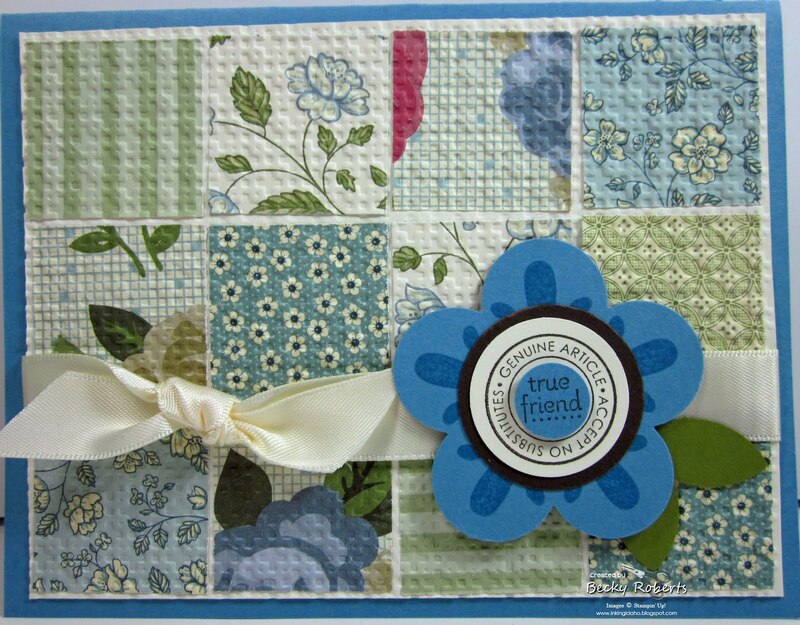 I said before that I really didn't think I would like this set, but I'm so happy Stampin' Up! chose to use this one. I would have never purchased it on my own and I would have missed out on all this fun!! We're getting down to the wire with Sale-a-bration. It all comes to an end on Thursday, March 31st...just a couple days from now! Still enough time to take advantage of all the free products. 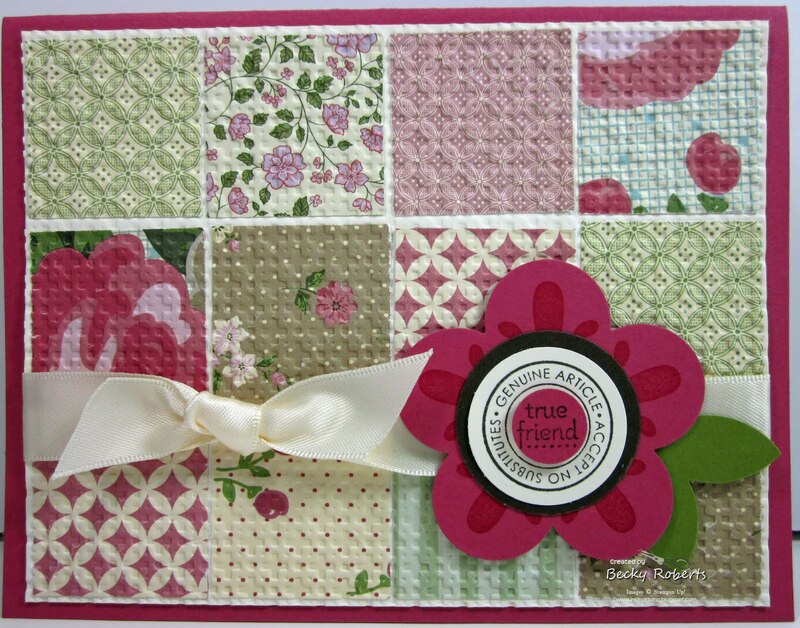 With every $50 purchase, you can choose a free product from the Sale-a-bration catalog. 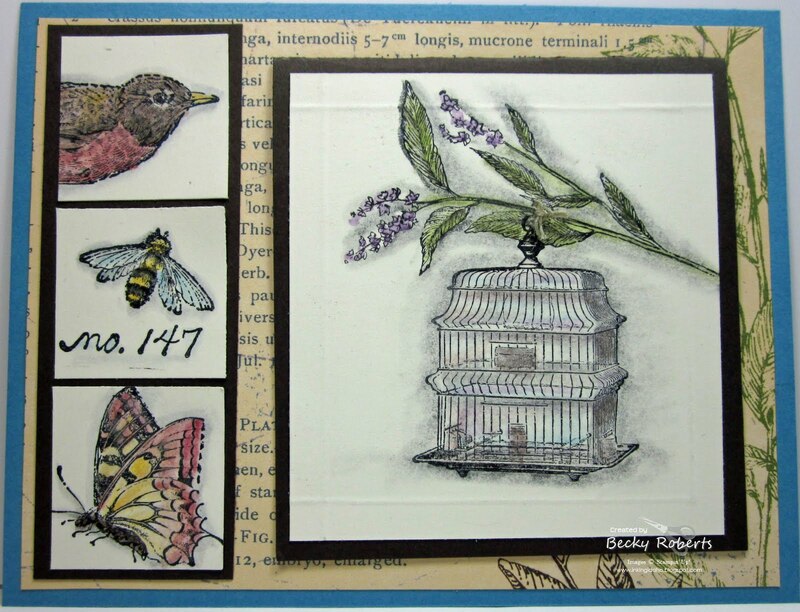 If you've ever thought about being a demonstrator, the starter kits are on sale until March 31st. You can read all about it HERE. I have a couple people to thank for the inspiration on this one. Patrice Herrera for the layout and Lisa Young for the block style. I found them both on Stampin' Connections, our Stampin' Up! demonstrator share site. We're getting down to the wire with Sale-a-bration. It all comes to an end on Thursday, March 31st...just a little less than a week from now! Still enough time to take advantage of all the free products. 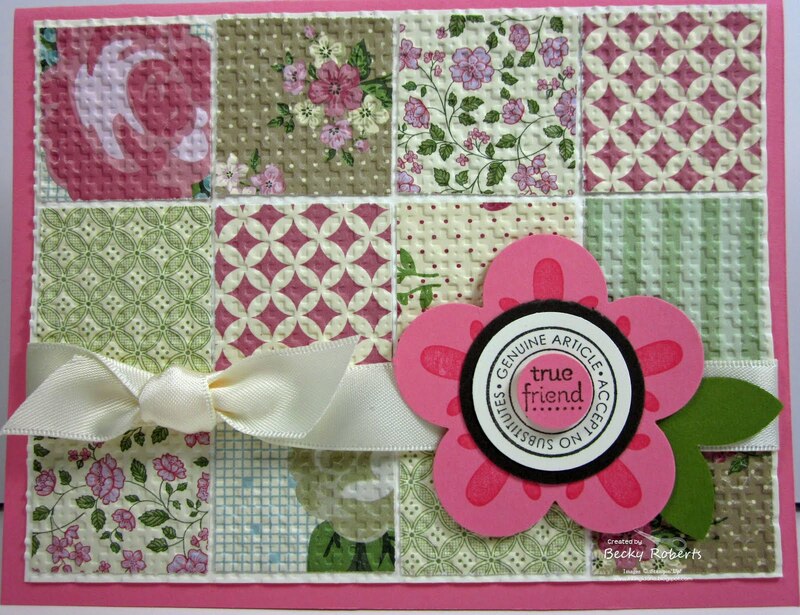 With every $50 purchase, you can choose a free product from the Sale-a-bration catalog. If you've ever thought about being a demonstrator, the starter kits are on sale until March 31st. You can read all about it HERE. Also, sign ups are still being taken for Scrappin' Frendzy! 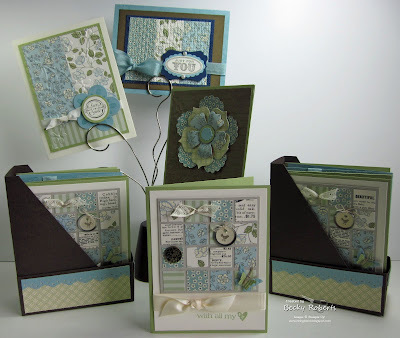 I've been asked to be the Stampin' Up! vendor for Scrappin' Frendzy! This is a fun scrapbooking day where each guest will get 4 feet of scrap space to spread out on. They serve a Continental breakfast and lunch, have free classes (I'm teaching one of them) you can sign up for, and lots of fun in store. If you would like to join in on the fun or would like more information, please contact Susan Beard at susanbocc@yahoo.com. These are cute, quick little candy wrapper-uppers. That's a word, right? I found these little coconut candies at Cost Plus Market. They have the best variety of unusual candies. Always fun to look there! 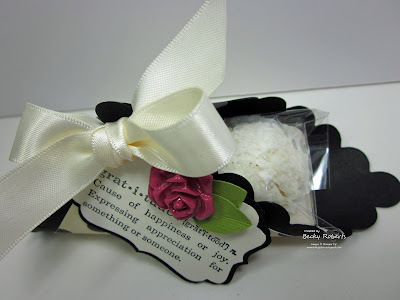 The words are stamped in Black on Very Vanilla and punched out with the Decorative Label punch. The layering is the question. 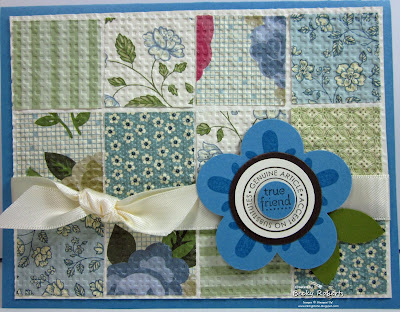 I punched 2 additional ones in colored cardstock and cut them apart and patched them on the back to created a layered look. The back now looks patched and messy, so I placed an additional punch over the back to make it look better. PLUS - You get the following bonus bundle absolutely FREE (a $50 value). I ♥ FREE stuff, don't you?? Here are the details - Save 30% on your first product order of $150 or more (placed within 45 days), plus earn hostess rewards AND receive a minimum of three Sale-A-Bration gifts (1 for every $50 in product purchased). IT'S GOOD TO KNOW: There's no penalty to drop and you keep the kit and everything you purchased at a discount! You'll enjoy full demonstrator privileges through June 30, 2011. To remain active beyond June 30, 2011, $300 in product sales is required - including your own purchases! JOIN MY TEAM! 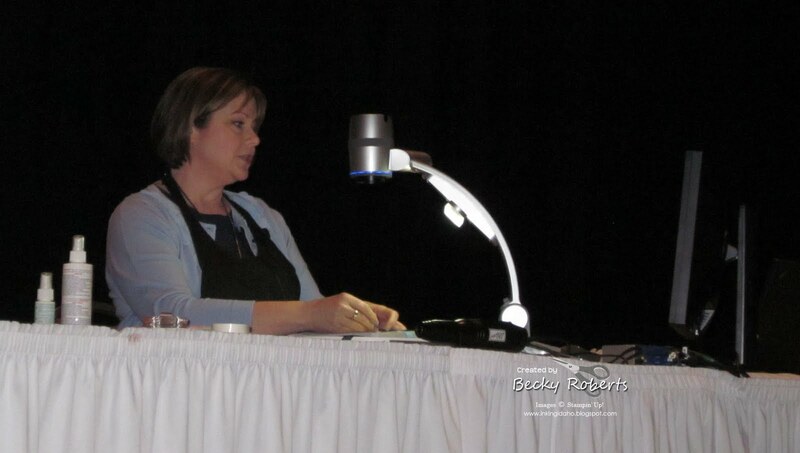 When you sign up for your starter kit with me, you become a member of my personal downline, Inking Everything. We live nationwide and are entirely virtual, low pressure and fun! My team members receive access to a private blog just for them, with exclusive projects and videos. 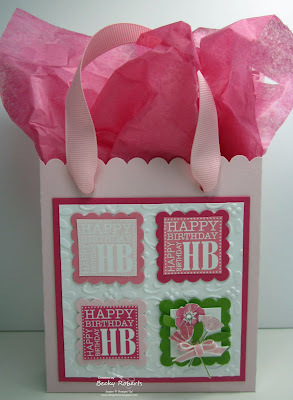 Our blog is password protected and packed with Stampin' Up! 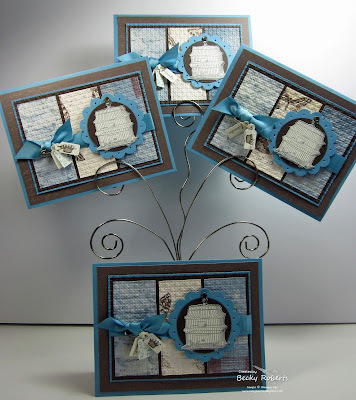 news, inspiration and rewards exclusive to our group. My team receive complimentary copies of all my tutorials before I release them to the public. And, if you join now, you can request previously released tutorials at any time. SIGN UP ONLINE and enjoy instant benefits. Go to http://www.stampinup.net/esuite/home/beckyroberts/ Click on Start Your Own Business. 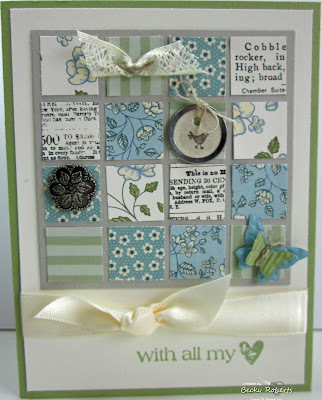 I've been asked to be the Stampin' Up! vendor for Scrappin' Frendzy! 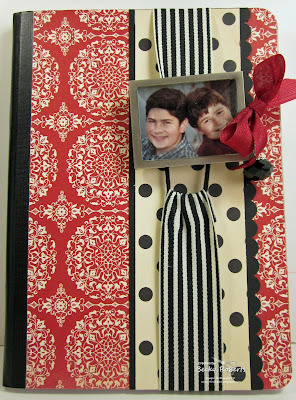 This is a fun scrapbooking day where each guest will get 4 feet of scrap space to spread out on. They serve a Continental breakfast and lunch, have free classes (I'm teaching one of them) you can sign up for, and lots of fun in store. If you would like to join in on the fun or would like more information, please contact Susan Beard at susanbocc@yahoo.com. 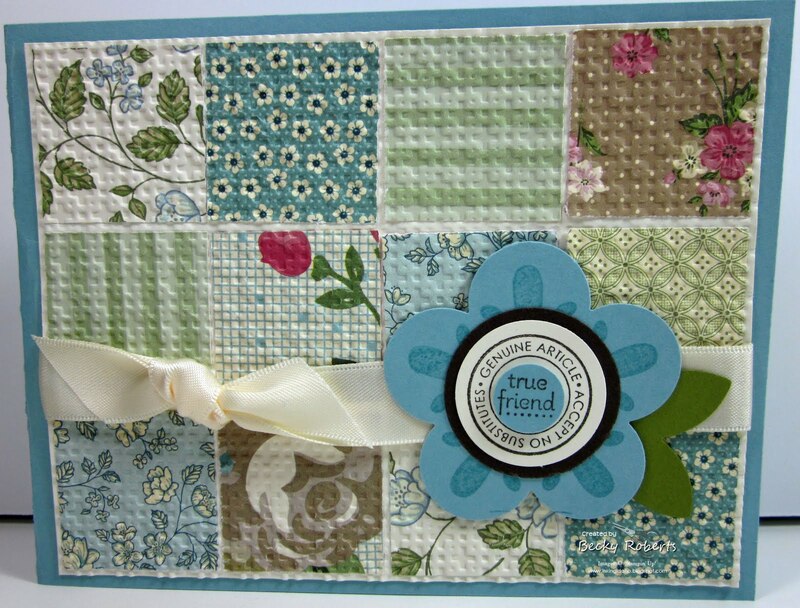 The Scrappin' Friendzy is Saturday, April 9th from 9am to 5 pm. 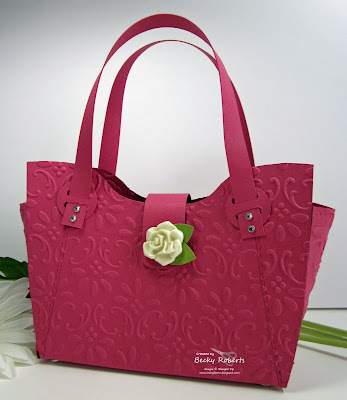 This is the third in the spring colors collection...sounds like we should all be on the runway, huh? 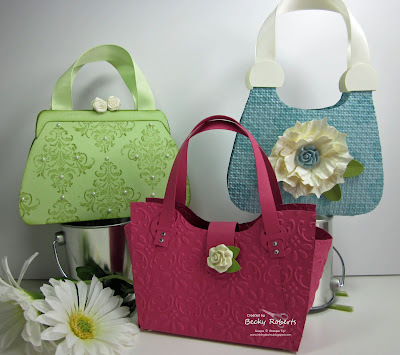 Actually I'm preparing for a scrapbook day and needed some purses for my table so they got a spring makeover! 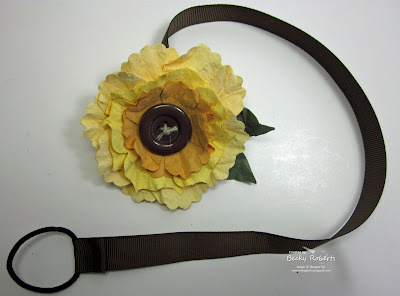 If you would like to make one or all of these for yourself, the tutorial is called Tres Chic Handbags and can be found HERE. This is the second of the three purses I'm showing this week. 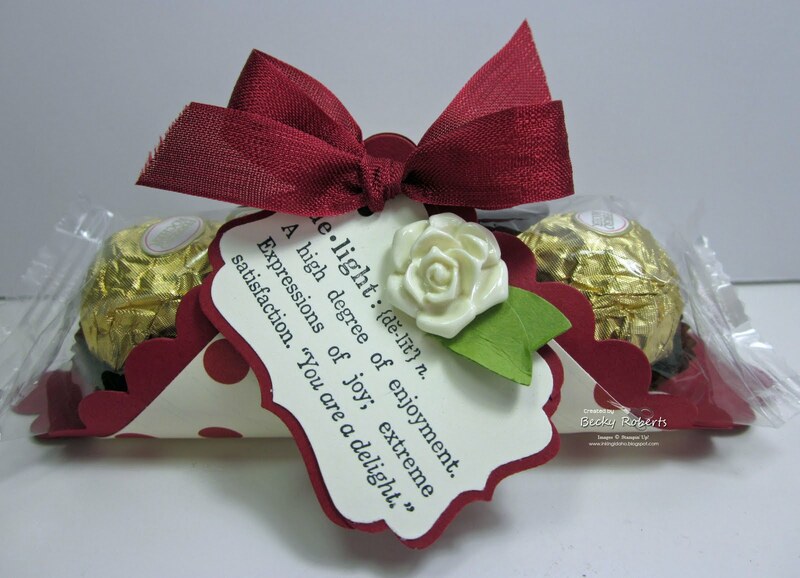 This one is just big enough to hold three or four 3 x 3 notes and envelopes, a small gift or a gift card. 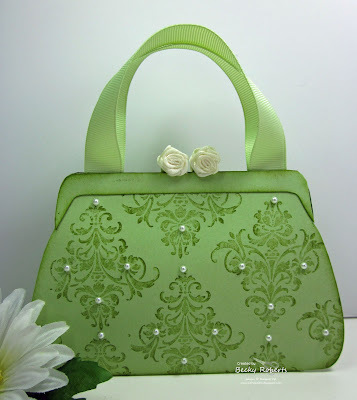 If you would like to make one of these for yourself, the tutorial is called Tres Chic Handbags and can be found HERE. 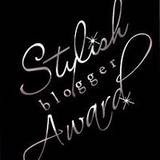 Thank you to Janice Spencer , Kari Metzger and Isabelle Cote for the Stylish Blogger Award. 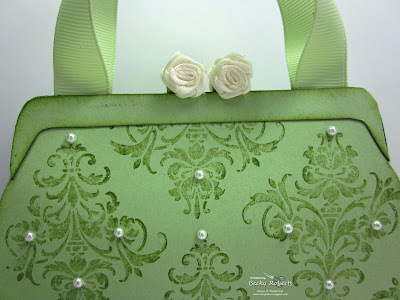 I've made a whole new set of Tres Chic Handbags to share with you this week. I wanted to have a few in spring colors. 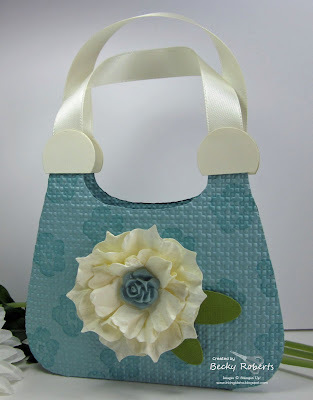 These little purses are so cute and quick to make. 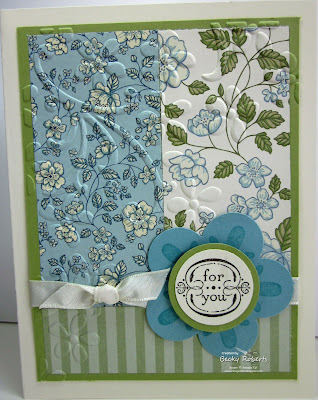 This one is big enough to hold three or four 3 x 3 notes and envelopes, a small gift or a gift card. Accessories: Stampin' Sponge, Certainly Celery Grosgrain Ribbon, Pearls, Vanilla Rosettes. 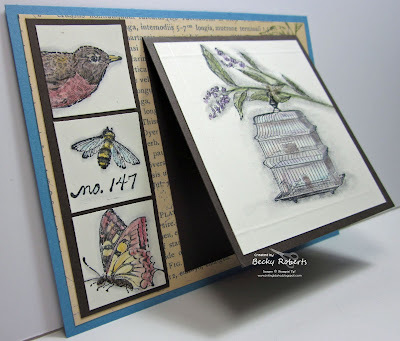 I had several scraps left over from my stamp club last week, so I made a few quick cards. We're down to about the last 3 weeks of Sale-a-bration. Still plenty of time to take advantage of all the free products. With every $50, you can choose a free product from the Sale-a-bration catalog. 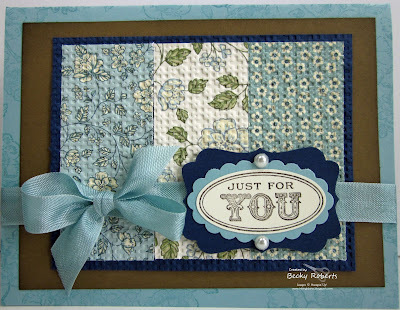 How would you like to fill your Stampin' Up! wish list and enjoy a discount on all your purchases? During Sale-a-bration the Starter Kits are on sale 15% off the regular price. Choose either the Standard Starter Kit or Digital Starter Kit and save $15% ($148.75)PLUS: You get the following bonus bundle absolutely FREE (a $50 value). Here are the details:Save 30% on your first product order of $150 or more (placed within 45 days), plus earn hostess rewards AND receive a minimum of three Sale-A-Bration gifts (1 for every $50 in product purchased). IT'S GOOD TO KNOW: There's no penalty to drop and you keep the kit and everything you purchased at a discount! You'll enjoy full demonstrator privileges through June 30, 2011. To remain active beyond June 30, 2011, $300 in product sales is required - including your own purchases!. If you are in the Boise, Idaho area and would like to host a show during Sale-a-bration, please contact me at yasou@cableone.net. 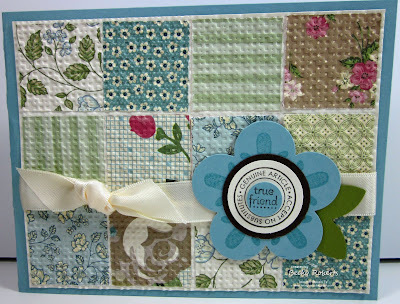 I would love to show you and your friends all the exciting things Stampin' Up! has to offer! 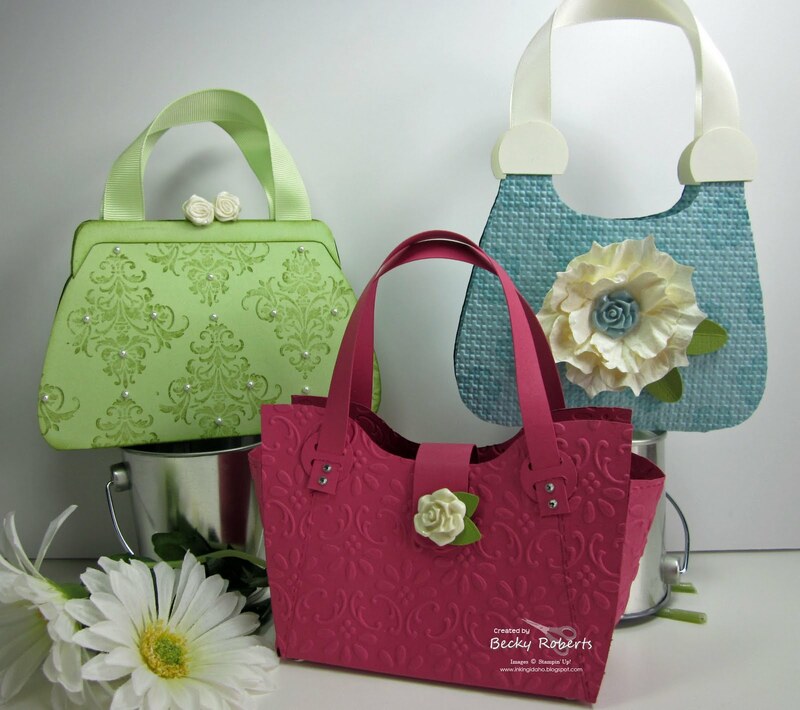 Plus with a $300 show, you receive a FREE Sale-a-bration product!! 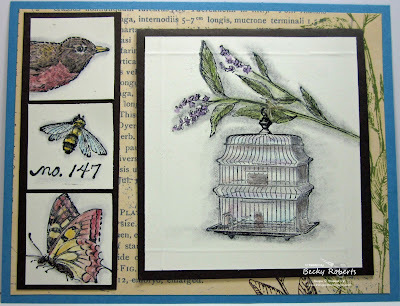 This months Stamp Club project for my local gals. 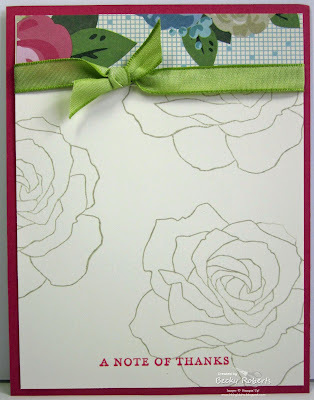 All the cards are using the new Springtime Vintage Designer Series Paper from the Occasion Mini Catalog. 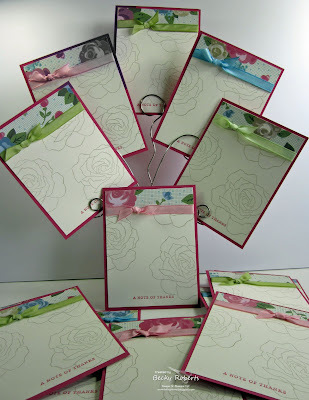 We will be making the Magazine Holder and 4 cards. 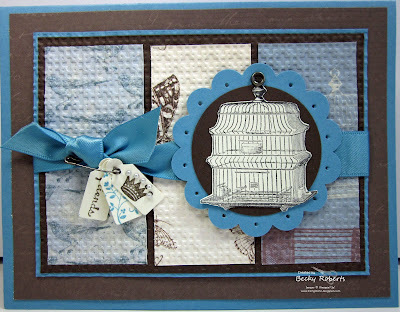 Thank you Krystal (skdeleeuw) for this great card idea. 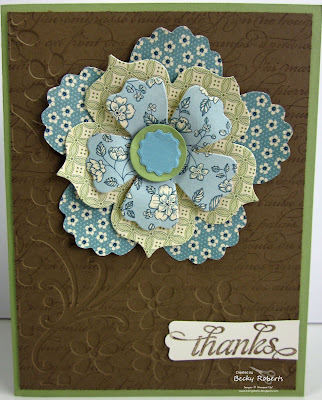 Thank you Connie Tumm for this great card idea! See you Thursday and Friday ladies! 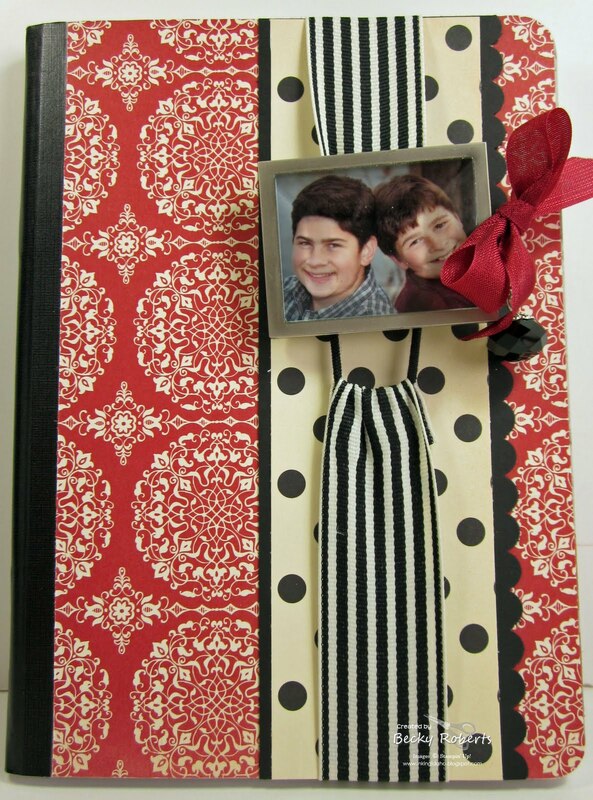 If you would like to make a Magazine Holder for yourself, the pattern is in the Designer Desk Set tutorial available HERE. 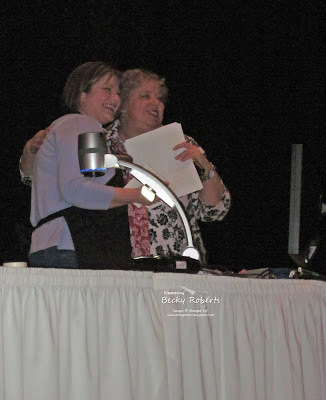 Boise Regionals - So Much Fun! I showed how to make Ribbon Bookmarks at the Boise Regionals on Saturday. Want to see??? These are 3 different size composition notebooks. 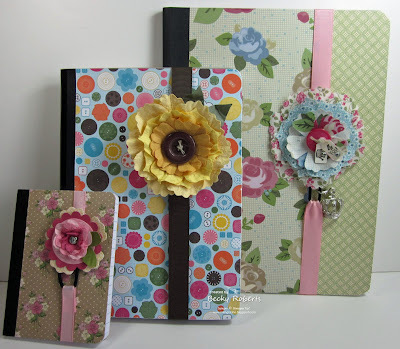 The small one is covered in Springtime Vintage Designer Series Paper and the bookmark is made with the Floral Fusion die-cut Circle and scallop Circle Punches, and the smallest flower on the Fun Flowers die-cut. 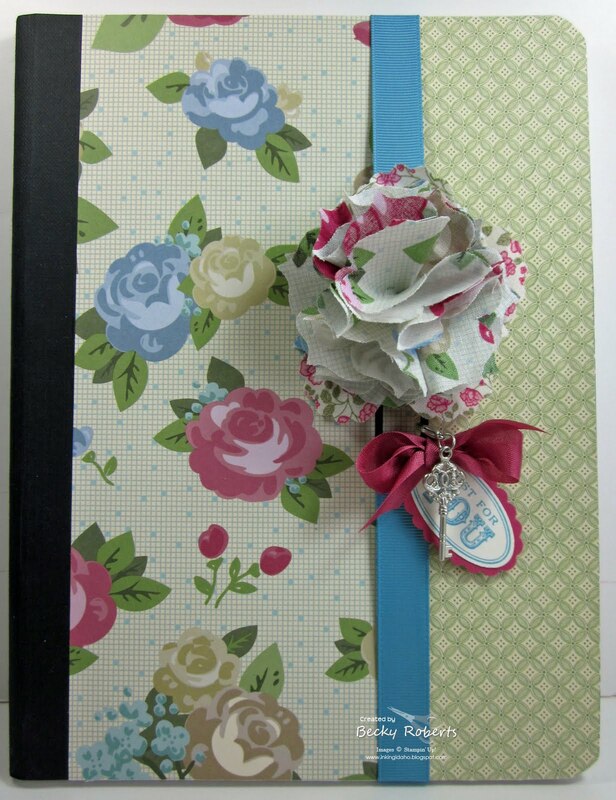 The medium one is covered in Sweet Stitches Designer Series Paper and the bookmark is made with Fun Flowers die-cut and a Big Button. 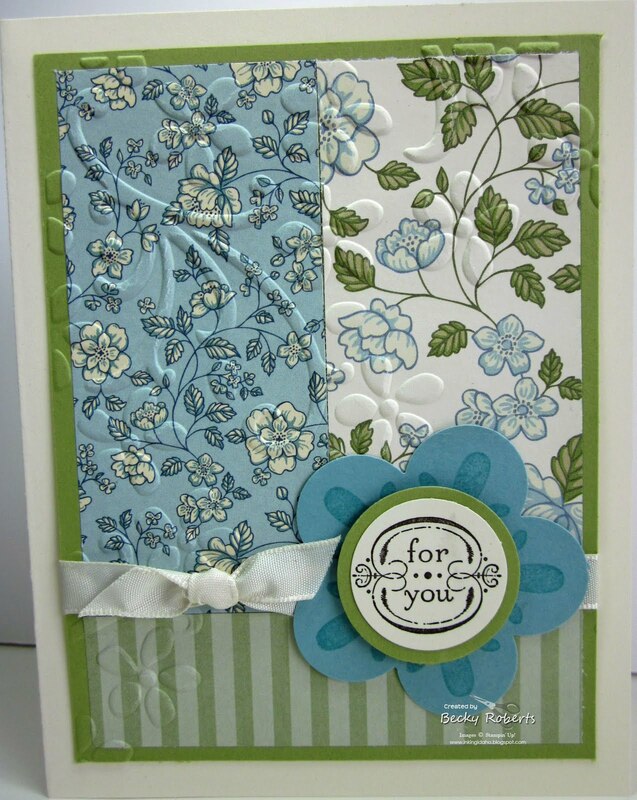 The large one is covered in Springtime Vintage Designer Series Paper and the bookmark is again made with the Fun flowers die-cut, this time with the Springtime Vintage Fabric. Here is a ribbon bookmark off the book. 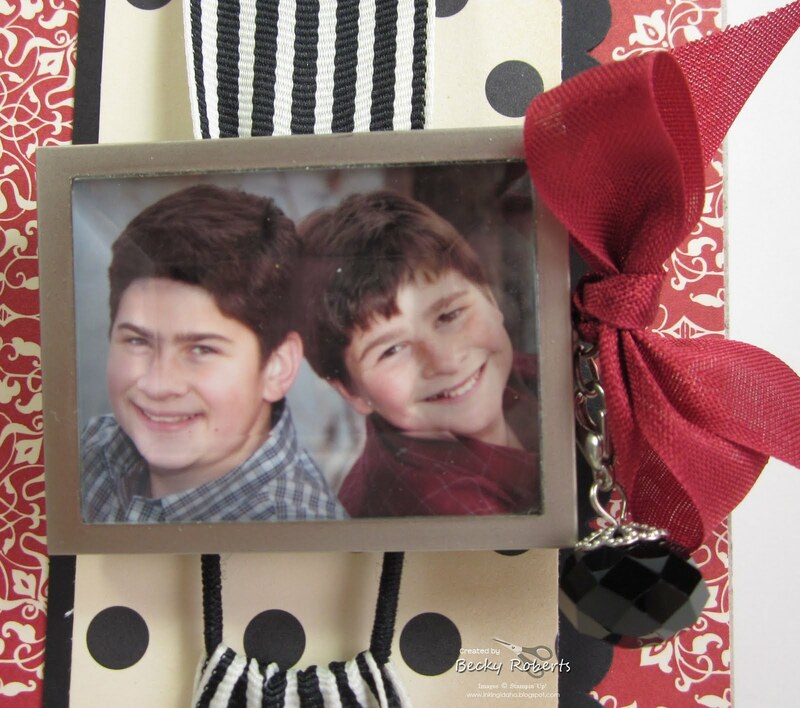 If you would like to make one for yourself, the tutorial is in the 12 Days of Christmas 2010. 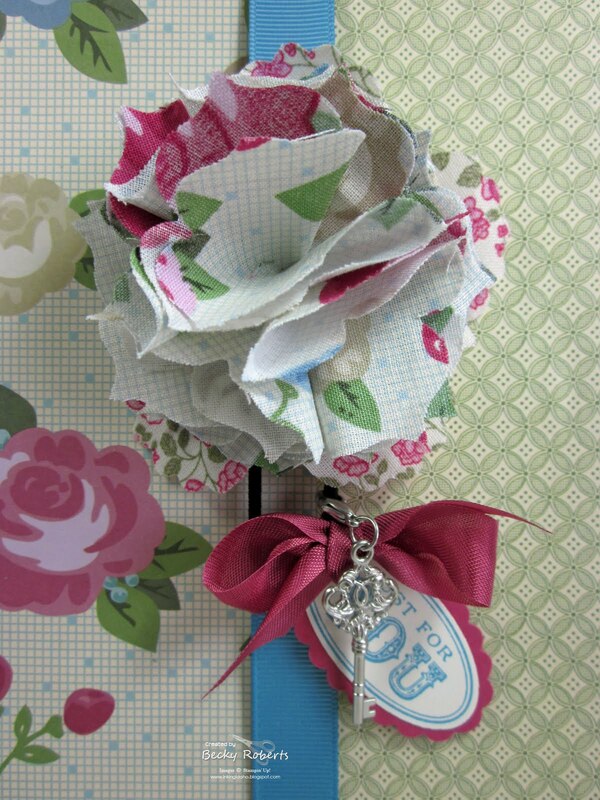 This is the one I demonstrated. 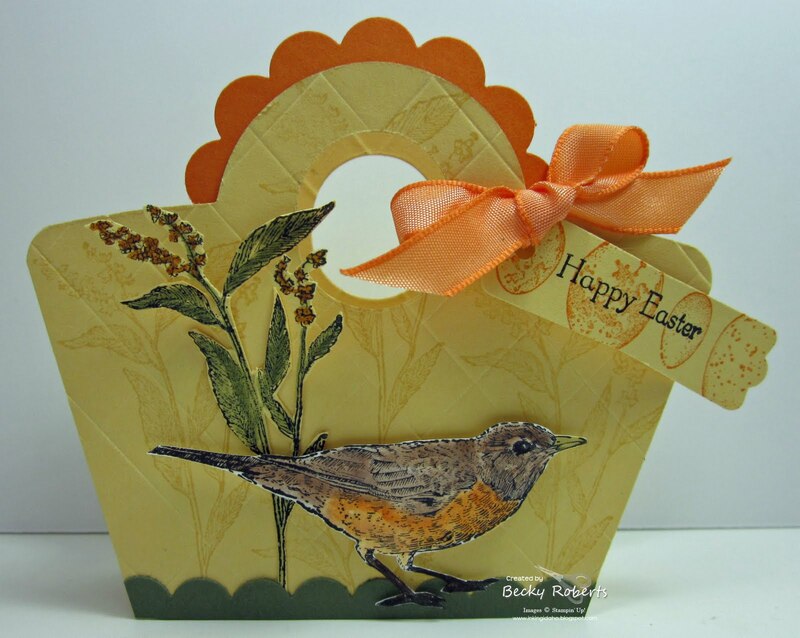 I used the Vintage Springtime Designer Series paper and matching fabric. Here I am doin' my thing. This was a half day Regional so they didn't have a camera man. They use an Elmo and you have to watch yourself on the computer monitor in order to see what the people saw on the big screen. As if demonstrating wasn't nerve wracking enough...you had to be your own cameraman *Ü* It was pretty easy though. Whew ... it's over! Bonnie Thurber to the rescue. How fun is this? They gave all the attendees a little pin as a memento of the fun day. Thank you Stampin' Up! 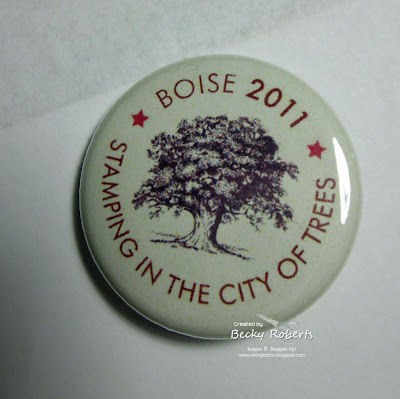 for coming to Boise.